Sign Up For a Free Guide! You’re constantly battling to get your child to nap, or to sleep at bedtime. Getting him to sleep is EXHAUSTING and frustrating. You’re not sure how much longer you can keep going. You’re not able to relax when your baby falls asleep. You know that at any minute she’ll randomly wake up and start crying, forcing you to pop out of your bed and start the bounce/feed/rock routine once again. You can’t remember the last time you and your spouse talked, much less went out together. You are both trying to function on such little sleep that anything else takes too much energy. You find it hard to be consistent on your own because you’re so exhausted. Although feeding/rocking/bouncing/driving route works, it’s so temporary and you’re up again in another hour doing it all over again. It’s time for a change. Tired of trying to figure this out on your own, tired of the rocking, humming, laying on the floor next to the crib. Tired of listening to your baby cry, tired of trying to explain your situation to other people, tired of feeling guilty about wanting to rest. On second thought, you’re not tired, you’re exhausted. In every sense of the word. You’re ready to take action and want guidance from an expert to help you along the way. This two week Comprehensive package is for parents who are DONE with feeling overwhelmed and stuck. They are ready for a plan of action that helps them achieve their goals with the support of an expert along the way. A digital intake form and sleep log so I can get to know your child’s sleep history, current routine, and any concerns you have. 1-hour phone consultation where we’ll discuss your child’s sleep issues and current sleep needs. I’ll educate you on the reasons why your little one is having troubles and provide you with the information you need to teach your child great sleep habits based on his individual needs. We will discuss routine changes, what steps to take first, second and third and go over all the options for sleep training for you to choose from. A fully personalized 10+ page sleep plan, that will include everything discussed on our call plus additional suggestions, tips and advice to get your child sleeping better than ever! Two weeks of telephone and daily email support. Once you have your detailed plan, we are in contact every day, either by phone or email. This way, I can provide you with the encouragement you need and answer any questions you have as you help your child transitions to a new and improved sleep routine. Daily analysis of sleep logs. Along with daily check ins, you will be sending me sleep logs each day, so I can offer further advice along the way. Four 15-minute phone calls during week one and a daily email on the days without phone calls. This keeps us in constant contact when the bulk of the changes are happening. Two email exchanges per day during week two. 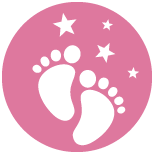 As your baby starts to sleep better, this is when we often need to make tweaks to our original plan. We work with your baby’s progress! Once we’re finished, you’ll be given my ‘Sleep Resource Guide’ which addresses the most popular questions you may have once our training has concluded. Private Access to small add on packages that are only available for previous clients, should you want to fine tune any areas down the road. You recognize that your child is tired and will protest changes, but that her sleep needs take priority and you are ready to get to work helping her. You have several weeks in a row that are free from appointments, travel or any interruptions. Your support system (spouse/partner) and caregivers are fully supportive with instilling healthy sleep habits. You have confirmed with your pediatrician that sleep training is suitable. You are very uncomfortable if your baby cries (whether you’re in the room with them, or out). You do not have two weeks in a row that are free from travel, house guests, etc. Your pediatrician has indicated that sleep training is not suitable at this time. A. No. Developing healthy sleep habits is based on patterning sleep routines with a child’s natural biological rhythms, reducing the level of sleep deprivation that a baby is experiencing and then weaning any dependency of sleep associations that is stopping a baby from having healthy and restorative sleep. There are important steps that MUST be in place to have a healthy sleeper. A. Definitely not. There are many options to choose from for the actual sleep training method. I go over all the pros and cons of each method, along with timelines and what suits personality types. I provide all the information; but I always ask parents to choose a method that feels right for them and their family. Q. “I believe that it is biological normal for a baby to wake at night. A. Great news! I also believe it’s biologically normal for a baby (or anyone else for that matter) to wake at night. There is a difference between brief night wakings that happen in between sleep cycle transitions, versus extended wakings that interrupt sleep cycles, cutting off the deep and restorative sleep that is needed for your child’s cognitive, physical and emotional development. We work at developing healthy sleep patterns and eliminating ones that are destructive. A. I never tell parents to stop feeding their babies at night. In fact, I will often encourage more night feeds if I see there are signs that it is needed. Healthy sleep habits and night feeding are not mutually exclusive. I nursed both of my children at night and they were independent sleepers. Once your order is placed and payment is received, you’ll receive a link to fill out your intake form. We’ll contact you within 24 hours of receiving your intake form to schedule our call! We have our call, you receive your sleep plan, and after two weeks of support and encouragement, everyone in your house will be sleeping better! Please note: Separate consults are required if you need advice for more than one child, with the exception of multiples! Refunds cannot be issued once a sleep plan has been sent.